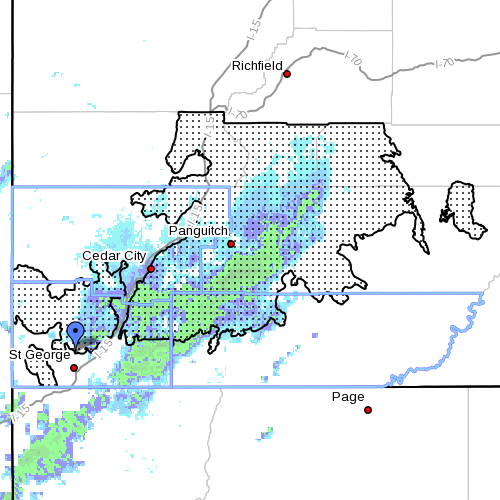 SOUTHERN UTAH – The wind advisory is expired and the National Weather Service has now issued a “winter weather advisory” for the southern Utah mountains, including the cities of Loa, Panguitch and Bryce Canyon City, which is in effect until 9 p.m. today. • Snow accumulations: New snow amounts of 3 to 6 inches are expected with locally higher amounts along the Interstate 15 corridor. Lesser amounts are expected across eastern portions of the mountains. • Timing: Snow heavy at times will continue through early afternoon before tapering to showers late in the day. • Impacts: Winter driving conditions can be expected along all high elevation roadways including portions of I-15. • Precautionary/preparedness actions: A winter weather advisory means that snow accumulations will cause primarily travel difficulties. Be prepared for snow covered roads. Use caution while driving. Visit UDOT’s Road Weather Alerts.